The Georgia Aquarium is defending its decision to hire an executive recently accused of animal abuse. José Luis Barbero, a trainer who was recently shown in a video allegedly mistreating dolphins at a marine park in Mallorca, Spain, will be a senior vice president at the Atlanta aquarium. In a statement emailed to The Dodo, Mike Leven, chairman and CEO of Georgia Aquarium, said that the facility has a "zero tolerance policy against the mistreatment of any of our animals" and that the footage was not taken at a facility belonging to the Georgia Aquarium. Barbero, who had worked at Marineland Mallorca since the 1980s, left his post there Friday after announcing his move to the Georgia Aquarium. 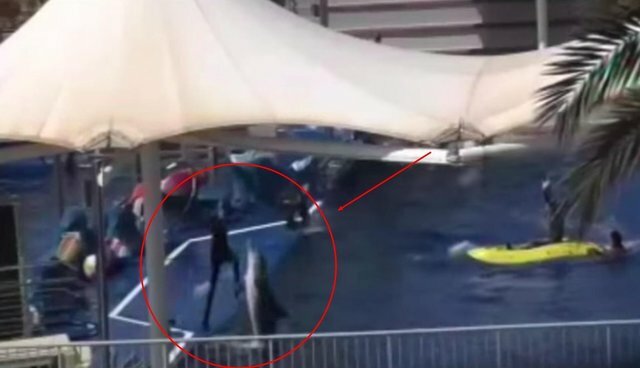 On Tuesday, the animal advocacy group SOSdelfines posted a video of Barbero allegedly hitting, kicking, jumping on and screaming expletives at the Spanish park's dolphins. [Barbero's] 35 years of professional experience have been thoroughly reviewed and vetted by the leaders of Georgia Aquarium, and we are confident in his commitment to the wellbeing and care of our animals. The aquarium did not immediately respond when asked to comment on Barbero's actions in the video. I believe a response is needed to this brutal and cowardly campaign against my profession...I can only say from my lawyers' recommendations that this video is a montage created to provoke a campaign challenging my professionalism over 35 years. Marineland Mallorca has condemned the video. Rafael Abraham, the park's director, told Spanish news site 20Minutes that he is "shocked and embarrassed" by the footage because it does "not at all reflect what we do in Marineland." Jennifer Berengueras of SOSdelfines told The Dodo on Thursday that the video, which was shot partly by disturbed neighbors of the marine park, is meant to show how captive dolphins are treated. "...[O]ur answer is to ban shows and breeding of animals immediately and then for them to be taken to a sanctuary - semi-freedom in the ocean - and maybe considered for release -although we are aware this is a complex and not always possible objective," Berengueras wrote in an email. The group is also filing two formal complaints against Marineland Mallorca.